I'm quite pleased with the colors in the SFC Shirt Tail Hemmed Cardigan so far. 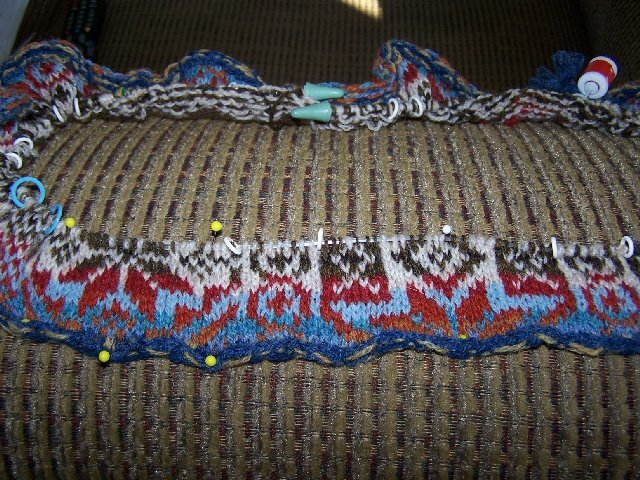 I have now used all the colors at least once and am glad I worked in the brown rather than kept trying for greens. Color work is addictive but you do have to pay attention. The chart was blown up large, mounted to a piece of cardboard and strips of cardboard are moved every row to keep track of where I am. The strips are held on by big paperclips which Boots, the cat, loves to steal. 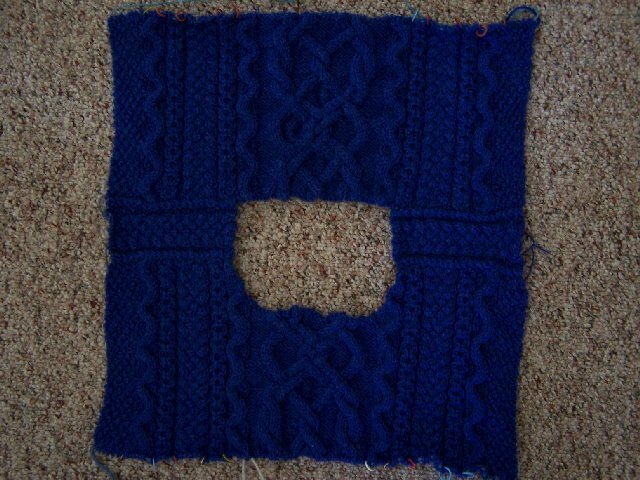 Chart is large enough that it can stand up in my knitting bag and can be seen at a glance. Not sure I'll ever memorize that chart. FLAK Aran is going well also. I can still memorize Aran patterns and this is a soothing knit. Probably substituting a large cable for the middle three smaller cables will end up being a mistake. I don't like all the purl around the cable and it does pull in in places. The cables really do line up front to back though it doesn't appear so in the photo. 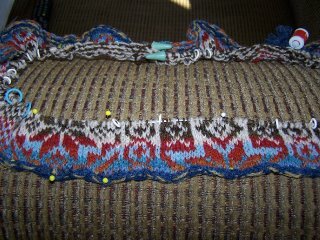 I'll be adding about an inch to the front as all my sweaters measure 9 1/2" in arm depth. I must like roomy Arans. Hopefully Janet will have the sleeves up by the time we leave for a long driving trip. Long drives always equals knitting time - except when you drop the cable needle. Hi Anne, I hope to start my SFC project later today. You have motivated me. I made my FLAK sleeve depth 9" but will re-evaluate to make sure it is sized correctly. Actually all the rest of my Arans measure 10" and I don't think they are floppy. Most are Starmore Arans and they really aren't designed any differently for sleeve depth.